At the end of May my husband Tim Gallagher and I took a trip to southeast Alaska where we explored a bit of the Inside Passage and the Tongass National Forest. We were on a small boat run by The Boat Company — only 20 passengers and about 10 crew members — which meant we were able to get into little coves and natural harbors that were well off the beaten path. 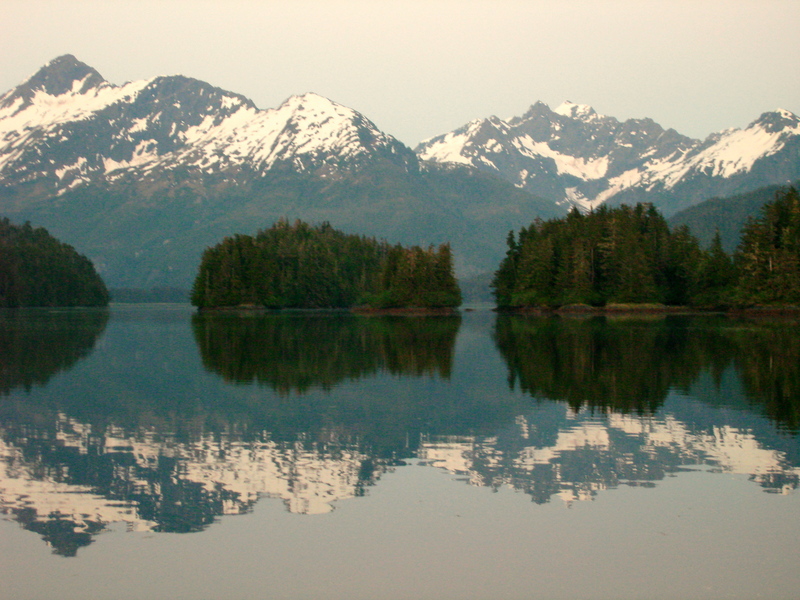 For a week our daily routine was to kayak in the deep, cool Alaskan water before breakfast, walk through the northern rainforest — some of it old growth — after the meal, and tour around the area in skiffs or fish for halibut, salmon, or trout before dinner. We saw humpback whales breach, brown and black bear foraging along the shoreline, and more bald eagles than you could shake a stick at. 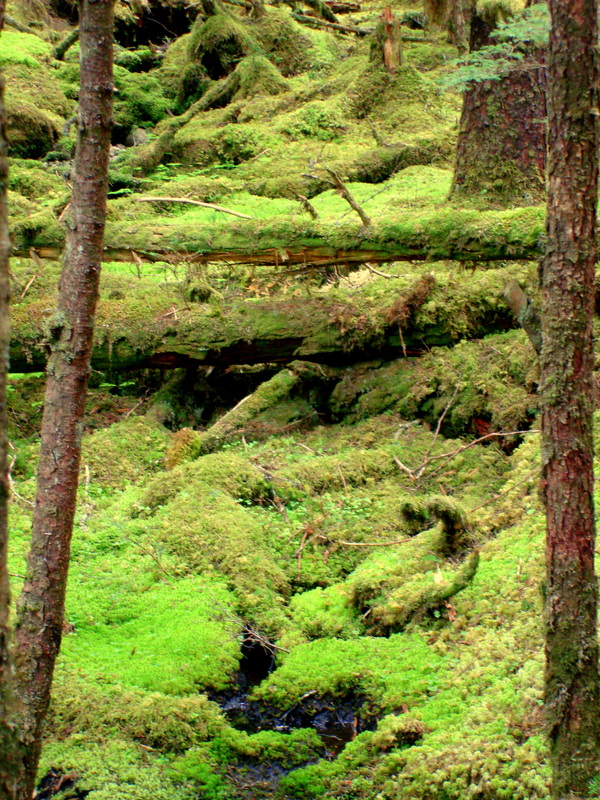 The Tongass is the largest national forest in the United States with a huge section of it designated wilderness area. As Clinton was leaving the White House he enacted a ban on logging in wilderness areas. Two years later, an exception to this ban was made for the Tongass, which has enormous stands of Sitka spruce, hemlock, and red cedar. It’s hard to imagine full-scale logging in what looks like a pristine area (I did catch glimpses of a couple abandoned logging roads that were now bright green with the growth of alders) and just the idea of what would be involved in putting in roads to support a logging operation is mind-boggling. And for what? Pulp? Wood chips? Wood for Japan? I have to throw my hat in the ring and at least comment on this. Someone named Daniel Rainsong says he has photos of an Ivory-billed woodpecker in the Sabine River Basin in East Texas taken on December 29, 2009. Okay. Bring it on. Here’s the beginning of a blog post written by Matt Mendenhall, associate editor at Birder’s World that does a great job of summarizing what’s known about this claim so far. At the risk of giving credibility to a possible hoax, here’s what we know about the latest report of an Ivory-billed Woodpecker sighting. If Daniel Rainsong has photos of a living Ivory-billed Woodpecker, as this press release claims, he has not yet shown them to two leading Ivory-bill experts. There is no one who would be more thrilled than I if this turned out to be true. For several years it was all-ivory-bill, all the time because my husband Tim Gallagher was one of the first to rediscover the species in Arkansas. Tim subsequently wrote about his rediscovery and Cornell’s efforts in his book The Grail Bird. I also wrote about the rediscovery in Audubon Magazine. I went out flying with Tim yesterday morning but there were no ducks to be found on the little pond. MacDuff flew over the pond, took a quick look, then headed for a flock of pigeons that were coming off a nearby horse farm. He chased the pigeons then took some passes at a ball of starlings that erupted from a clump of trees. Finally he came back over the pond, hoping his fortunes had changed. No such luck. As the days get colder in Upstate New York there’s hope that the ducks will begin migrating through with some regularity. Each day, before dawn, Tim gets up, puts his peregrine MacDuff in the back of the truck, and starts driving around the countryside in search of ducks that might have dropped into ponds during the night. So far there’s not been much action. I went hunting with Tim right after Christmas. He drives to a pond several miles from our house where he hunts ducks. We’d had a recent thaw and there was quite a bit of open water on the pond so he was hopeful that would draw in some ducks. It’s tough to see how many ducks might be on the pond from the road — as they tend to hide in the reeds along the edges — so it’s a bit of a crapshoot when you put your bird up. 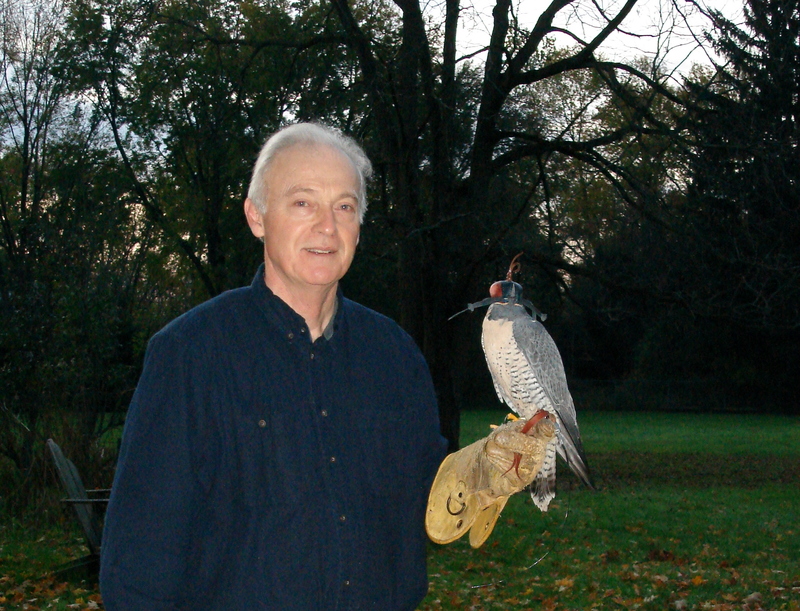 Tim was acting as both falconer and bird dog that day. After he put his peregrine Macduff into the air, he snuck up to the pond by approaching it from the side where there’s a high berm. He spied several mallards on the far edge so he kept his eye on his bird and when he was in position high overhead, Tim rose from behind the berm and yelled and clapped his hands like a madman. The mallards took off low and hard, and although Macduff had a wonderful stoop at them, he was not successful in hitting any that morning. 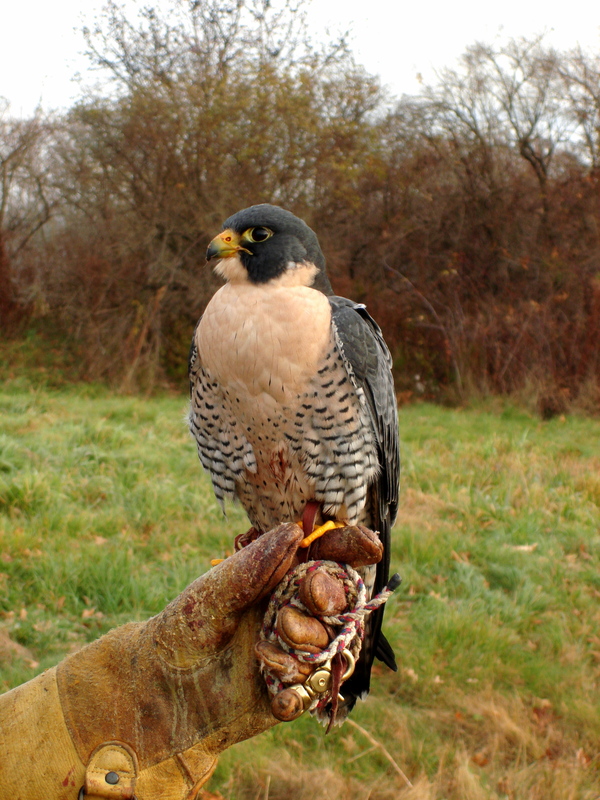 My husband takes his peregrine Macduff to the field and lately its been getting a duck a day. Macduff isn’t satisfied with going after hens or smaller ducks — he targets the big drake mallards. Our freezer is getting full. Fortunately, the kids like grilled, marinated duck breast.